As the dust settles on the 2018 GAA Championship, SURE has delved into the stats behind the season to give GAA fans a greater insight and understanding of how Dublin’s footballers become just the third side ever to win four All Ireland Football titles in a row and of course, how Limerick broke a 45-year drought to lift the Liam MacCarthy cup for the eighth time. Sure compiled and analysed every pass, tackle and shot of Limerick’s Championship season to shed light on the stats that powered their performances. 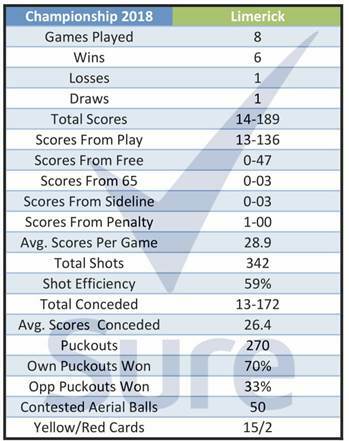 Limerick’s ability to retain possession from their own restarts appears to have provided the platform for their level of scoring, as they won 70% of their own puckouts. This compares favourably with Galway for example, who managed to win 52% of their puckouts.